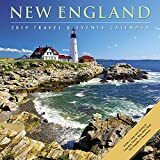 The New England Travel & Events Calendar includes stunning photography of areas all across New England from Vermont to Maine. Each month includes a "Special Attractions" column and a 2-page "Number Please" directory providing telephone numbers for local venues. 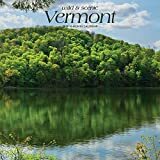 Vermont’s name likely derives from the French les Verts Monts (the Green Mountains). Indeed, this lovely state offers the stunning natural scenery of the Green Mountains and majestic Lake Champlain, as well as spectacular fall foliage that draws visitors from all over. With towns that practically define classic New England charm and its picturesque countryside, Vermont is a true feast for the eyes. 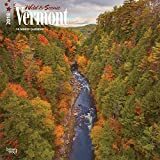 Take a visual tour of Vermont with this beautiful square wall calendar. A stunning collection of photos showing all of the best aspects of the Green Mountain state. 12" x 19" when hung.